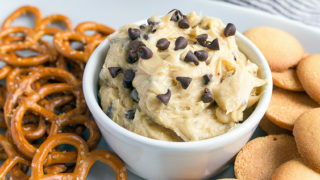 Edible cookie dough dip for one (small batch style!). Maybe two. No, definitely just one serving here. I’m not proud of my snacking behavior this week. My New Year’s resolution was to stop skipping breakfast, and unless you count milky tea, I have definitely broken my resolution. There was the morning I had 3 dates for breakfast (dates, as in the dried fruit, not awkward meet-ups). The next morning, one slice of melting sweet potatoes. And I’m afraid I sunk as low as leftover cold tater tots yesterday morning. And as the saying goes, if you skip breakfast, your eating habits quickly decline for the rest of the day as well. And while I should probably be more concerned, I just can’t because this delicious, creamy edible cookie dough dip is the result of some wayward sliding eating habits. And it is so very good and worth all the things. It is edible cookie dough for one. It’s a small batch of eggless cookie dough meant for dipping and eating raw. It’s heaven-sent. I had a cookie dough craving, and I solved it without eating a ton of cookie dough. And for that, I should get a medal, don’t you think? This recipe makes one small heaped ramekin of edible cookie dough dip for one. For those of us that cannot be trusted around cookie dough, small batch treats are a gift. I need to know: what’s your cookie dough behavior? When you make chocolate chip cookies, what ratio of dough actually makes it into the oven? I’m afraid I’m good for about one cookie’s worth of dough on my spoon, raw. I lack the patience to wait for the warm cookies to come out of the oven. Plus, cold creamy cookie dough is pure comfort for me. If you don’t like it, there’s probably something wrong with you genetically, and you should definitely get that checked by a doctor. 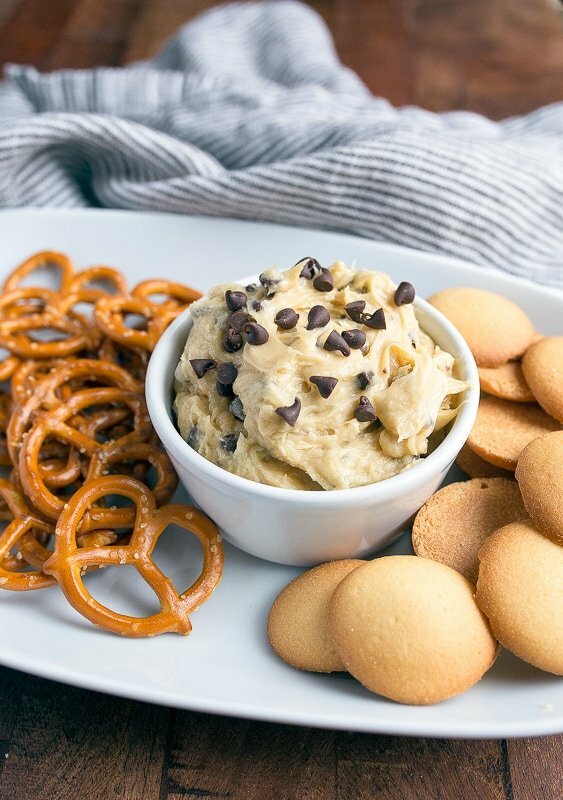 This dip has all the lovely components of cookie dough, but a bit softer and more dip-able! 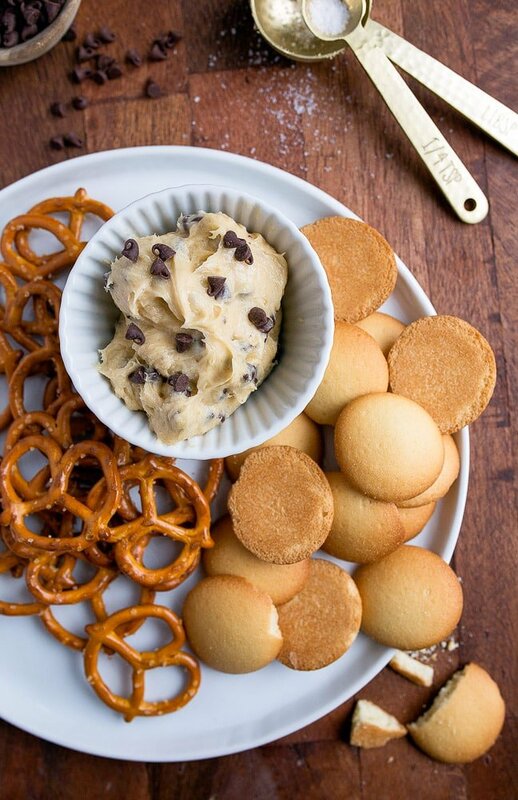 You can dip pretzels for that sweet-salty thang, or you can dip vanilla wafers. I switch off–one pretzel, one cookie, and then suddenly, the whole ramekin is gone. And yes, if you’re a better person than me, you can easily double this recipe and share it with someone on the couch during a Netflix marathon. I just don’t have it in me to share edible cookie dough dip for one. Sorry. A small batch of cookie dough dip. 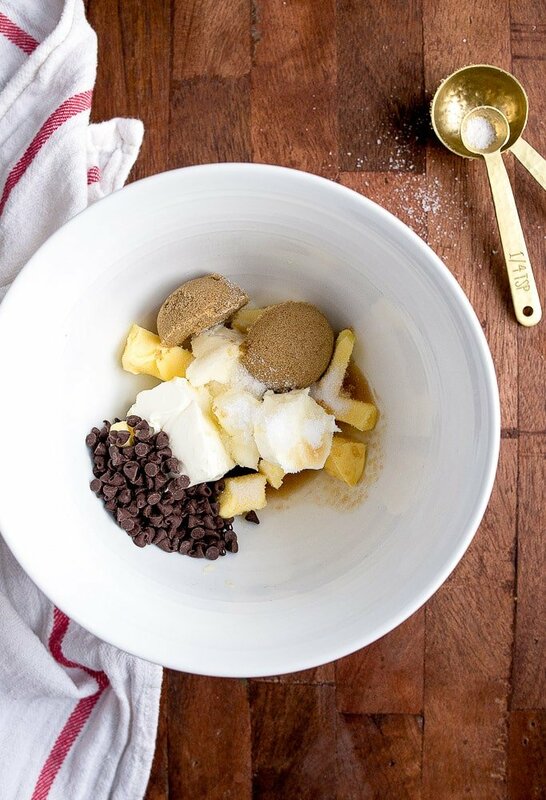 In a small bowl, beat together with an electric mixer all ingredients (except the chocolate chips), until creamy and light. Pile the creamy dip into a serving bowl, and serve with dippers. This sounds like the perfect snack, or breakfast. I always eat the raw cookie dough. Quality control and all. I love that this recipe doesn’t have flour in it. I am always a little leery about eating raw flour or feeding it to the kids. They will love this too, if it makes it to the table. I might have to double it or hide it on them. :-) Thanks for the recipe. But this “small” serving is nearly 940 calories – not including the dippers!! This is terrible for a quick snack or breakfast! It’s almost an entire day’s worth of calories. How do you get to that total? Put the ingredients into MyFitnessPal – I said a recipe was 2 servings and it was 416 per serving. 416+416=932. This doesn’t include pretzels or fruit. Thanks for the heads-up. I was going to enter it into MFP…. think I will pass!!! This isn’t a healthy food blog – your comment is unnecessary. If you haven’t even made it, there’s no reason for you to comment! This recipe looks delicious and plenty of people splurge once in awhile on a yummy snack. Does Christina look unhealthy? Didn’t think so. I plan on making this during the coming week and I’m sure it will be delicious! Love that there’s no flour! I was reading that raw flour has the potential for e. coli. Eeeeeek. I will probably be making this tonight. Oh my. I think I’m going to attempt to smuggle this into the movie theater tonight with me. Wish me luck! Let’s see. Handsome husband. Beautiful baby girl. A job I would kill for. Successful. Beautiful lady, inside and out. Cookie dough dip. Christina, I don’t want to be a little like you. I want to be a lot like you. You are so sweet, Julie :) Thank you. Darnit Jeannie… Stop dipping into my cookie dough!!! Raw cookie dough is just so addictive ???? This looks yummy and is a great alternative???? Wondering if you could sub the cream cheese out for something dairy free? Then these could fulfill all my dairy & egg free (allergy) dreams! Thanks! Great question, Brooke! Have you tried tofu cream cheese? Or, you could use an extra 2 tablespoons of butter? This is such a fun snack for those of us that have no self control! Hi Christina, Was looking for something quick and delicious to make and came across this recipe in a search. Just made it! Yum! Made a double ‘batch’ and added some mini graham crackers I had on hand to ‘mine’. Thank you so much! Very glad I found your awesome blog! You were in Parade magazine! Congratulations! I enjoy your blog and just ordered the new book! Thank you for all of the wonderful recipes! Oh my God YAY. I just found out I have a gluten allergy so this will satisfy my inability to eat actual chocolate chip cookies. Now we need the vanilla wafer recipe. Have never heard of a raw cookie dough medical emergency, like is it real? I can just keep eating cookie dough in peace, right? Made slutty brownies over the holidays; raw cookie dough + raw brownie batter = no self control. Like maybe, there’s a big raw brownie batter issue in our house and we ate a scoop with ice cream. Good news? No food poisoning! 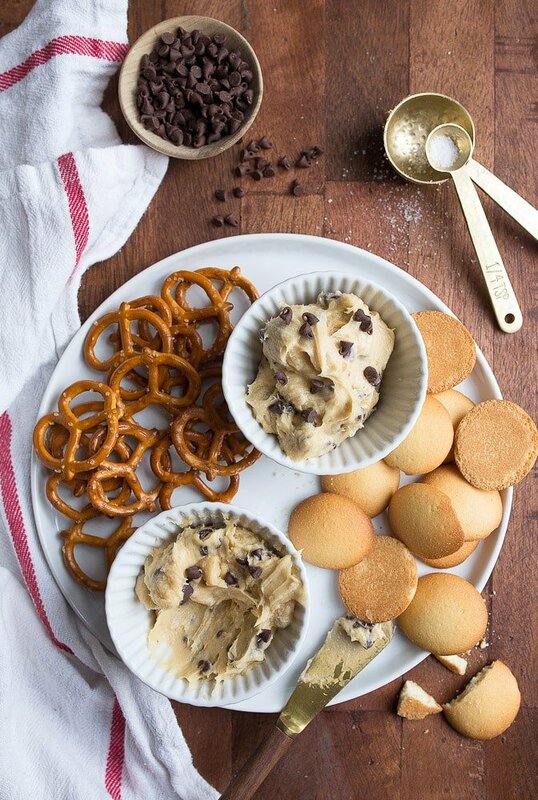 Cookie dough dip — YES PLEASE! !